And some of the individual panel toning is going way over the top. I feel maybe we need a friendly reminder to use a little restraint. Funny. I think a lot of weathering doesn't go far enough. Depending on the subject, there are some very battered and dirty aircraft throughout the annals of history. I'll agree, though, that there is perhaps too much focus on defining panel lines vs. managing tonal variation across the entire surface. I agree and I don't agree. I see some builds where the weathering is better suited to a tank, like adding rust... that doesn't belong in any aircraft weathering tablet unless it is some abandoned airframe and even then one has to keep in mind it's mostly not steel? Visable rust means not going to fly....period, doesn't matter what the item is. I've seen others that are really heavily weathered and they are really really nice. I think the trick is remembering what we are modelling, if it looks like a worn out tank, it's not an aircraft, tought times or not they were not tanks. For me, less is more. I prefer simple weathering: Used but not Abused. Beyond that, heavier weathering really calls for the model to be displayed in a vignette or diorama to look and feel right. I dislike the heavily pre-shaded 'organic' look. Real jets from the 1960s-early 1980s did not look like that - but modellers are exaggerating scanned kodachromes (which see things the eye never did). The jets were stained, often heavily on pale grey undersides, sometimes chipped, sometimes matted, but never looked like the 'toads' and 'fish' that pre-shading generates. Dirty panel lines yes. Pre-shading no. Makes them look less like models I know, but nothing like the real thing either! Sometimes we don't weather enough. This hurricane is seen as it was at the end of its service life before restoration. We seldom show old paint coming through as it equates with a poor finish. It's all about references and taste, but I agree the pre shading can be OTT. There is only one way to do authentic weathering; get a photo of the real thing (or the same aeroplane in the same theatre) and use whatever techniques and products you like to reproduce what you see in the photos. It's what I did with my Corsair. Now for the shameless plug: For those who have Facebook (please let's not have a FB debate here, if you want to do that start a thread in the appropriate place) I have set up a page dedicated to weathering model aeroplanes. It's called Scale Aircraft Weathering. The key tenet of this page is exactly what I describe, get a photo and try copying what you see. Already there are some great examples on there. Edit: The names of the pilot and the WSO on the canopy frames were not and are not standard on GAF aircraft. They just did that for the farewell ceremony. Weathering is something I've never really done much of with my models, and consequently it's a skill set I've never mastered. This thread is timely for me, as I've decided to build a string of models solely for improving my finishes and developing some weathering skills. Many of these will be deliberately over-weathered for the sake of experimentation and exploration. I'd love to be able achieve the sort of finishes that Jamie does! Besides the fact that I do not like painting in general, I also feel weathering is going "over the top" far too often. Granted, some WWII aircraft in rough field operations could get really dirty, and the paints of that era could take some serious beating (think Japanese WWII) as in this Finnish Hurricane. For modern jets, maintaining clean aircrafts is the pride of ground crews (and if wheel wells are white, it is to spot the odd leak). Some aircrafts (like the EE Lightning) were just dripping fluids from every hole or joint on the underside, but this was not a general rule. The SR-71 was also leaking fuel on the ground, until friction-heat elongated the aircraft and closed all the leaks. The heat at Mach 3 was also taking a toll on the paint, but these are one-offs examples rather than the norm. 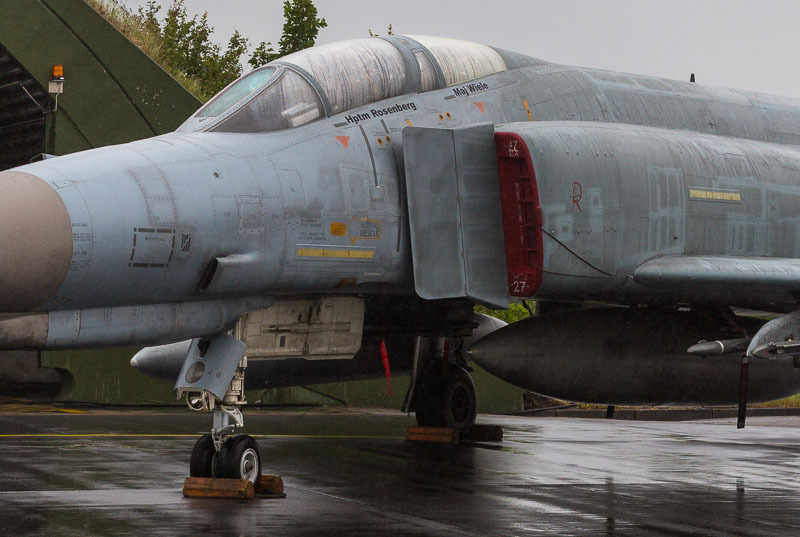 Rainer's Phantom is from a retiring aircraft, which means probably months before the crew chiefs decided repainting them was a waste of time and money. Plus, looking at the concrete of the runway) it seems the aircraft just took a shower from a drizzle, which will accentuate temporarily the panel lines. So yes, under non-standard conditions, this is a proof that heavy weathering is possible, yet I do not believe this is the norm. And yes, scale reduction means that light is not captured in the same way on a kit as on a 1:1 aircraft, and weathering can help give the 1:1 scale feeling. But overweathering seems more and more the norm, and I personally distate the "Spanish school". Ernie, I'm with you. From what I've seen weathering is under-done on the majority of models, particularly with regard to decals and markings. You are absolutely correct, Hubert. From my Luftwaffe days I remember that the aircraft were kept pretty clean. Still, over the years I have developed a liking for the not so clean examples and I don't like the look of a freshly painted (fighter) plane. That's one reason why I never did any special schemes. Those birds just don't look like business. Anyway, interesting discussion and I will follow this closely since I am a novice with respect to weathering. We had this exact discussion a number of years ago in the armor-modeling world. The trend was to make your Tiger tank look like it had been attacked by graffiti artists after sitting unused in the elements for a decade...certain high-profile modelers decided "I'm going to make this model look abused in order to highlight my weathering products", and, whether or not the vehicle depicted was in fact historically based, started a trend. Everyone jumped on board and for awhile you couldn't find a model that didn't appear like it was ready for the junk pile, with grossly chipped paint, extreme fading, etc. In fact, one modeler depicted a King Tiger that was badly mauled...even went so far as to identify the particular vehicle, unit, and crew. When I got into my references, it turns out that tank was destroyed a mere two weeks after it arrived in theatre...so there was no conceivable way it could have 5-years of aesthetic neglect! As modelers, we've become lemmings...we follow the trends of the masses and tend to scorn things that fall outside of what we perceive as the "norm" . When I did my Arado 234, I filled the panel lines that were puttied over and filled on the actual aircraft, and the paint scheme was a semi-gloss finish with minimal weathering...after all, these aircraft were highly maintained and had very short operational lives. I had a judge knock it down because it wasn't dirty enough. Truth be told, and some point in ANY vehicles life...a tank, car, aircraft, even a ship...that vehicle had a clean, perfect paint job. Where we choose to portray that vehicle chronologically in it's life, determines the level of weathering we apply to it. We've all heard of rivet-counters and paint nazis (sorry if that offends anyone), but there are those in the hobby that believe that everything has to be dirty, abused, and distressed. Sadly, for the most part, that's not the reality of the vehicles we model. Unless I'm doing something derelict, I do panel lines with a wash, perhaps some subtle post-shading with pigments (much easier than the whole pre-shading method, ugh), exhaust, minor streaking from oil leaks, etc., and some basic chipping if the aircraft warrants it (IJN/IJA especially). So we have rivet-counters and paint-nazis. Should we have weathering-commies next? A lot of the models I see that suffers the typical preshading are weathered to the same extent all over (it is all equal! ), with little regard for how real aircraft weather.Anything that is new and is being used will start to show signs of wear - we all agree on that. However, some areas will get dirtier/faded/chipped quicker than others. Oil leaks from the engine, lubricants from hinges of flaps, dirty hand marks around removableservice panels, bootmarks and grime within walkways - all these features can tell how an aircraft "lives", and means that applying the same look all over is as unrealistic as a model with no weathering at all. Actually even more since the model may portray a brand new or pristine subject. LOL! I don't know if that would insult any of the commies we have in the audience, but sure...I've never been known for political correctness!